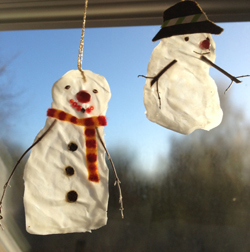 If you’re still waiting for snow to come your way, here are two ways of making snowmen, whatever the weather. Don’t forget to give them a smile! You can hang this little snowman at your window, or on a Christmas tree if you have one. – an old shirt or overall, to keep the glue off your clothes. – a tray or sturdy piece of board to leave your snowman on while he’s drying. – to decorate your snowman: thin twigs, peppercorns, berries, small beads, small buttons, sequins, pieces of felt cut to shape, etc. Click on the black and white image to download printable instructions. 1. Mix up some icing sugar with a little water (one teaspoon water to 3 heaped teaspoons of icing sugar will be enough for one or two cookies). 2. Spread some icing on your cookie to make a puddle shape. 3. 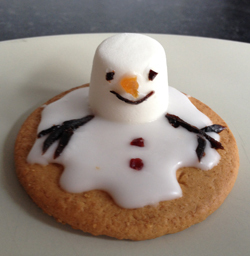 Place a white marshmallow in the puddle to make the snowman’s head. 5. Then he’s all ready to eat – YUM! That will make someone smile.